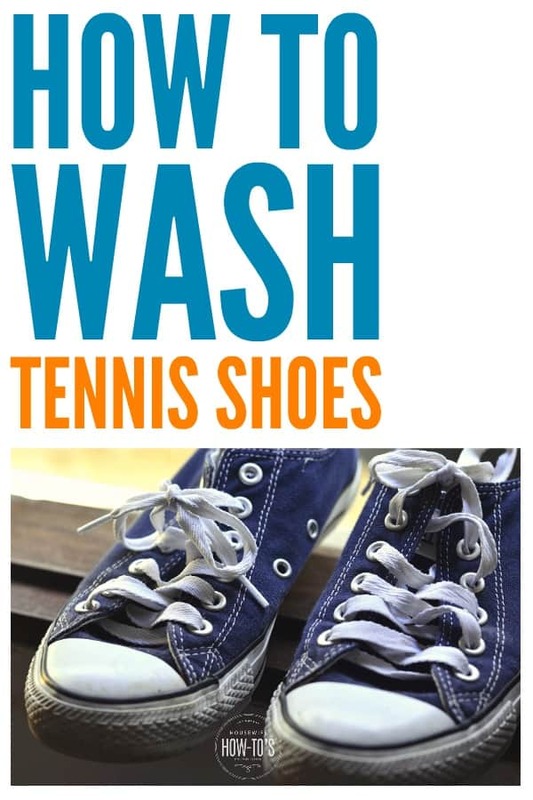 Knowing how to wash tennis shoes or sneakers to will help you remove stains, eliminate odors, and prolong their lifespan. Given how much a good pair of trainers cost, taking the time to clean them will save you money in the long run, too. Most tennis shoes or sneakers are machine washable without concern. Shoes with built-in orthotics or which light up should be cleaned using the “General Cleaning” steps below. 1. Remove excess dirt. Using a stiff brush, remove excess dirt from your shoes, especially the soles. 2. Unlace them. Laces tend to get tangled in the wash cycle, so remove them before laundering. Put the laces in a small mesh laundry bag or pillowcase and tie the top of the case shut, then toss it in the machine. 3. Add towels. Add a towel or two to the washing machine. These will act as scrubbers to remove exterior soil during the wash cycle and will also reduce the amount of squeaking you’ll hear as the shoes’ soles rub against the machine’s drum. 4. Wash properly. A hot cycle can ruin the glue holding the shoe’s innersole in place, so set the machine to a long WARM/WARM cycle. Add detergent but do not use chlorine bleach, vinegar, or fabric softener — all of which can damage your shoes. To treat stains, add a scoop of oxygenated bleach (like OxiClean). 1. Stuff and squeeze. To speed up drying time, stuff dry washcloths into your shoes and gently squeeze them to remove excess water from the innersole. Remove the cloths. 2. Using a dryer? High heat can warp the soles of your tennis shoes, so switch your dryer’s setting to the medium (permanent press) setting. Add your shoes along with the towels to reduce banging sounds, or use a mesh bag that holds shoes on the dryer door. Dry them on medium for 20-30 minutes then check to see if the inside is dry. Continue drying in 15-minute cycles until done. 3. Air drying. You can also air dry your shoes on a flat rack or by reinserting the laces and hanging them from a laundry line. Line-drying helps further deodorize them since sunlight is an excellent disinfectant. • Spot-clean small spills on shoes using warm, soapy water and an old toothbrush. Once clean, wipe the spot with a cloth dipped in fresh water to remove any soap residue. • Get rid of dark scuff marks using a small amount of toothpaste, or baking soda mixed with water. Gently rub the scuff using a circular motion until the spot is gone, then wipe clean with water. A Magic Eraser works, too. • Stubborn marks on soles can often be removed with a little nail polish remover and a soft cloth. Buff the area with the remover until the spot is gone, then cover it with a very thin layer of Vaseline or petroleum jelly to restore the shine and protect the surface. 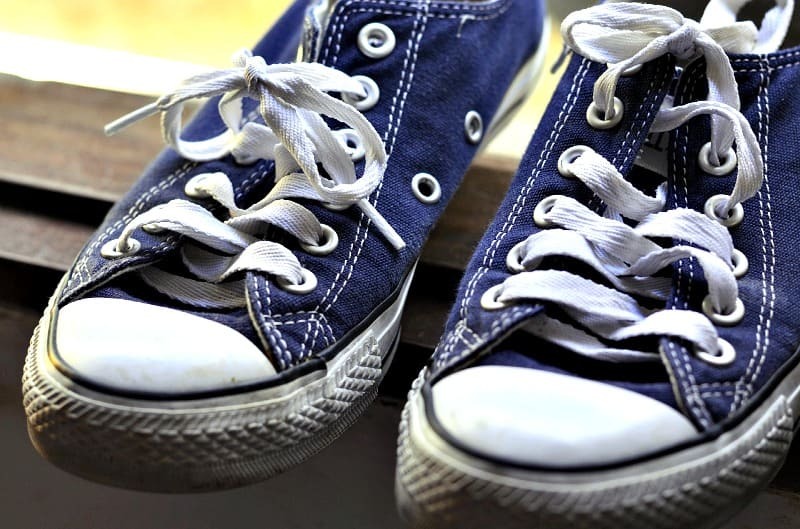 • If your shoes get smelly between washing, these tips on how to deodorize smelly shoes work wonders. How much water would I use? Assuming you’re only washing one pair at a time, set the machine for a small load.